George Hansford Rice, age 83, went to be with his Lord and Savior on Monday November 12, 2018. He was born August 12, 1935 in Ada, Oklahoma to Herbert and Ira (Newell) Rice. He grew up in the oil patch towns of South Central Oklahoma and North Central Texas. He started to school in Okemah, OK, then attended schools in Electra, Iowa Park, Wichita Falls and Jolly, Texas, then back to Oklahoma where he attended Ardmore Schools and was a graduate of Wewoka High School in 1953. He proudly served in the US Army before attending OSU receiving a degree in Civil Engineering in 1961. 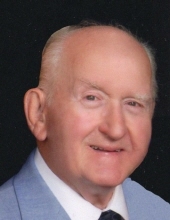 He gave his heart to the Lord in 1957 and was a member of Chisholm Heights Baptist Church in Mustang where he had actively worked and taught Sunday School for many years, from the youth dept. to Senior Adults. He coached little league football and baseball as well as working in Boy Scouts. George loved to hunt, fish, do wood working and travel. George and Judy were able to travel for over 20 years with 3 different travel clubs and visited every state in the United States including Alaska, Hawaii, and Canada. They also traveled with the Oklahoma Baptist Disaster Relief Team for 8 years. He was a 38 year federal employee (mostly in OK and TX) starting with the Soil Conservation Department and retiring in 1994 from the Federal Aviation Administration. George was preceded in death by his parents, his first wife Wanda (Taber) Rice, two sons Michael Keith and Mark Alan, also by one sister Betty Jean Graves. Survivors include his wife Julia “Judy” Ann (Corley) Rice, one son Steve Rice and wife Gay of Piedmont, one daughter Karen Kinsey and husband Charles of Pawhuska and two granddaughters, four grandsons and nine great grandsons. Also by four step daughters Kathy Engles and husband Rick of Jenks, Karla Buxton and husband Richard of Ft. Cobb, Karen Glidewell of Minneapolis, MN, Kelli Corley of Oklahoma City and one step son F.B. “Butch” Corley and wife Sheila of Broken Arrow. Several step grandchildren and great step grandchildren. Services will be held at 2pm on Wednesday, November 14, 2018 at Chisholm Heights Baptist Church, Mustang, OK with interment to follow in Yukon Cemetery, Yukon, Oklahoma, under the direction of McNeil’s Funeral Service, Mustang, Oklahoma. In lieu of flowers, donations may be made to Gideon’s International or the American Cancer Society. To send flowers or a remembrance gift to the family of George Hensford Rice, please visit our Tribute Store. "Email Address" would like to share the life celebration of George Hensford Rice. Click on the "link" to go to share a favorite memory or leave a condolence message for the family.